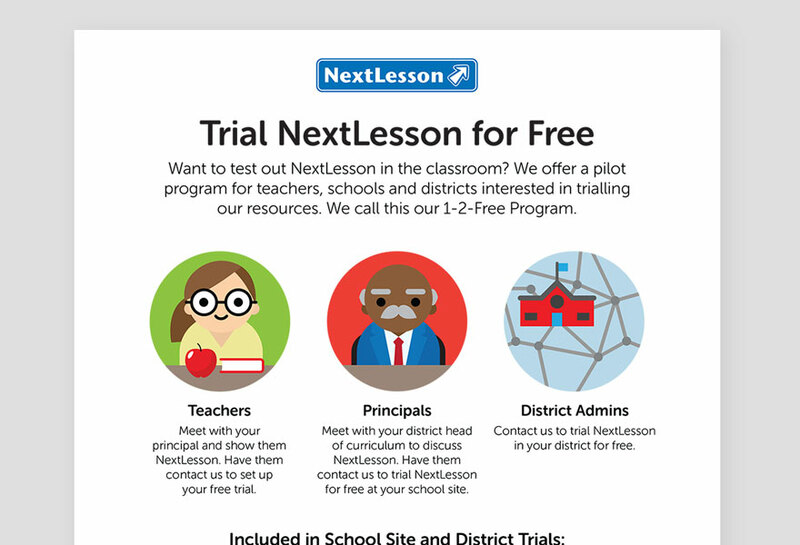 One of the biggest selling points of NextLesson's content is that its built around students' current interests. To stay up-to-date on these interests, we came up with the idea of an interest rating tool—a “Student Tinder”—if you will. 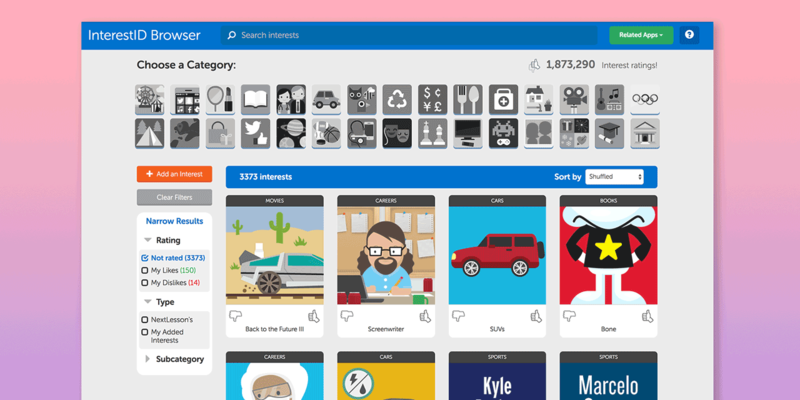 With InterestID, students can voice their interests by liking and disliking items within categories such as sports, movies, books, music, food and gadgets. If they can’t find a certain interest, they can add it in the tool – these recommendations help us determine which lessons we should create. 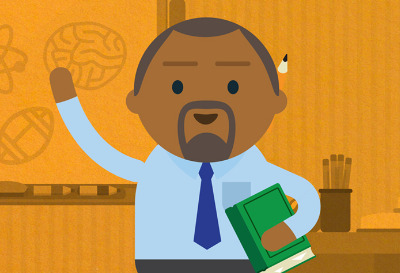 For teachers, they are then able to view the interests of their students in a summary that displays the top liked categories, most popular interests within those categories, and recommended lessons from NextLesson based on those interests. They can also view interest summaries for individual students or classes as a whole, and even track changes over time. An overview video of InterestID, with art and animation assets provided by our team. 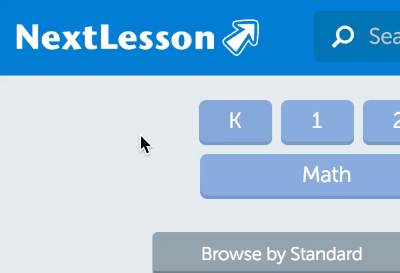 On the student view, the layout mimics our lesson browse page for consistency. 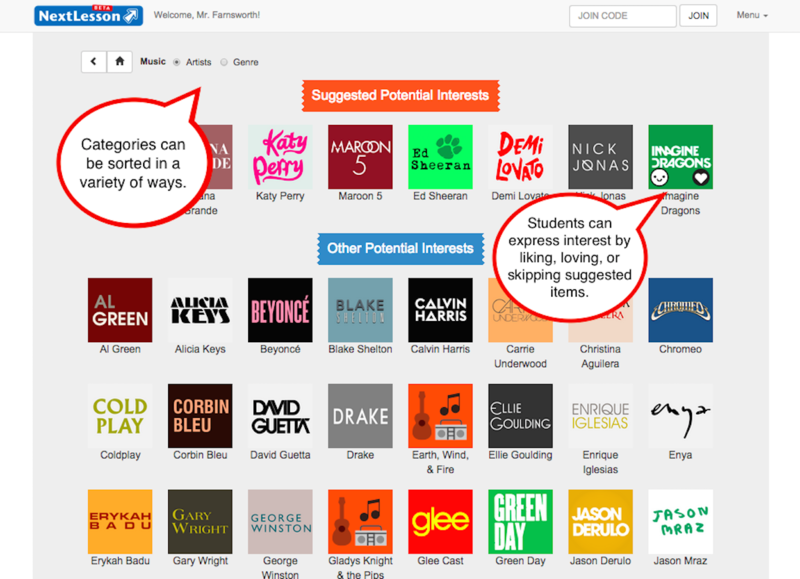 Interest categories buttons, which act as filters, are presented on top with unrated randomized interests on the bottom. To the left we have more filters to break down interests by liked, disliked and subcategories. As interests are rated, they disappear and the other interests shift over to replace it. A student browses the interests and votes on ones they like and dislike. 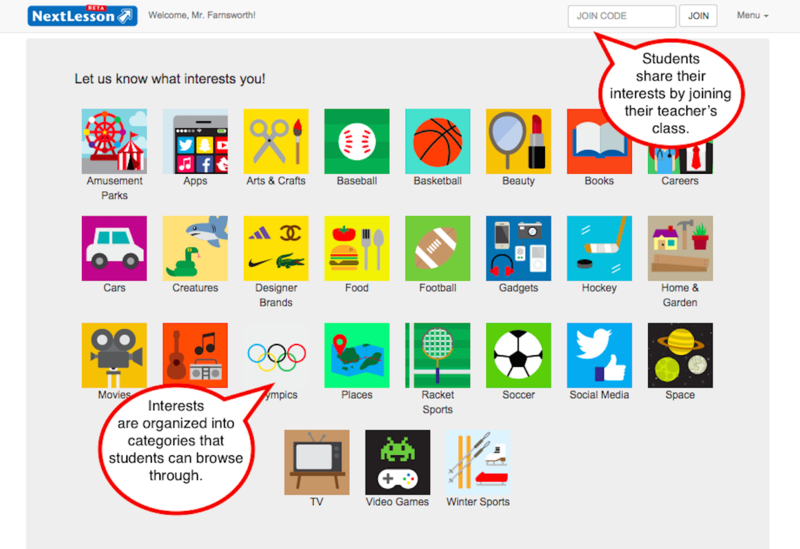 In designing the student side of the experience, we wanted to keep the interests front and center. We know students can be easily distracted and with over 3,373 interests, we took steps to minimize scrolling and page clicking. The idea was to try to keep the screen static as students voted. Conceptual functionality sketches. The top one was made by the project manager and the bottom by me. At some point, a student may want to look up something specific or look into their favorite hobbies. This is where our filters come in. We made our different categories readily accessible at the top, anticipating that this is something that the student would do quite often. 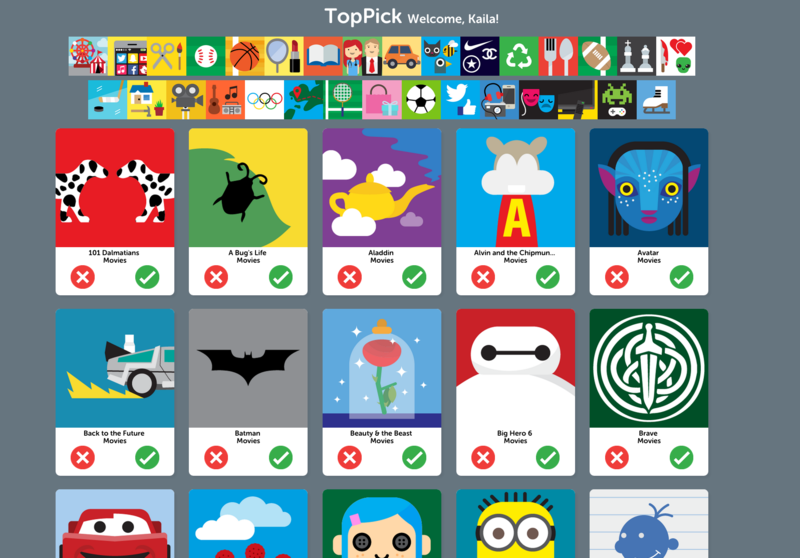 We implemented a simple system to filter by categories, as well as to show what you've liked and disliked. We put filters in so you can browse by category or by interests you've already liked or disliked. Originally, the project manager wanted to have the categories and interests separated. All works © 2019 Raymond Yuen. What is the leading cause of divorce in long-term marriages? A stalemate.